Our consistency and quality performance is maintained and unceasingly improved through our diligence and team commitment to our business management system, processes and workplace practices. 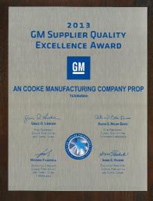 We are a IATF16949/ISO 9001 certified company. 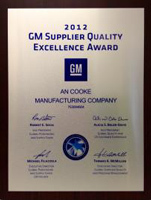 This Quality Management System defines the quality management system requirements for the design and development, production and, when relevant, installation and service of automotive-related products. 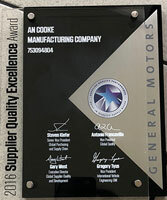 Our strong commitment to customer excellence and continuous improvement has been acknowledged and rewarded through positive feedback and scorecards rated by our leading customers worldwide. 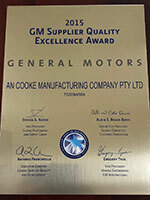 The greatest acknowledgement and honour has been receiving the GM Supplier Quality Excellence Award four consecutive years, 2012, 2013, 2014, 2015 and 2016. 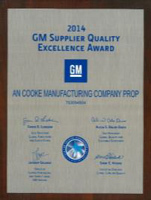 The award encompasses a supplier’s quality performance above the specified required standard over the past 12 months.